Three house districts were represented at Tuesday night’s League of Women Voters Debate: District 34 (South Kingstown, Narragansett), currently represented by Democrat Teresa Tanzi and challenged by Republican Stephen Tetzner; District 35 (South Kingstown), which is challenged by Democrat Kathy Fogarty and Republican Lacey McGreevy and District 36 (Block Island, Charlestown, South Kingstown, Westerly), currently represented by Donna Walsh and challenged by Independent Blake Filippi. Each candidate was given one minute for an opening statement before the questions began, beginning with Rep. Tanzi. "After four years experience, I have learned a lot about the challenges of getting legislation passed, " she began, "a process that requires deliberation and cooperation among people with very different sets of beliefs and needs." Despite those differences, I knew how to bring people together to make a coalition, like when I worked with reps and senators to pass marriage equality. I am proud of what I have done." 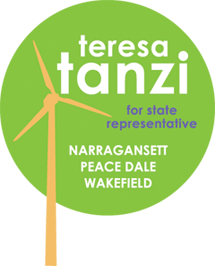 Next was Tetzner, owner of Homestar Mortgage, and Rep. Tanzi's Republican challenger. "in order to understand what values and motivations are at the center of my run for public office, one must first understand my upbringing," he said. "I was taught by example to set goals and to work hard. If you become successful, then you enjoy giving back. My family and I have always been involved in charitable work. The experience I bring is my business experience, economic experience and financial savvy. These are the practical qualities needed in this position." Question: Should Rhode Island continue funding to HealthSourceRI after federal funding expires next year or begin work with Healthcare.gov? Tanzi: Continue funding and try to expand the program to other New England states. Tetzner: We need to try to regionalize it and share the cost with other states, otherwise we won't be able to afford it. Question: Do you support the implementation of teacher evaluations and standardized testing as a graduation requirement? Tanzi: I support the changes that we passed in 2014 that delay the implementation of standardized testing as a graduation requirement. Question: Do you support state-wide teacher contracts? Question: Do you or would you take money from Political Action Campaigns (PACs) or special interest groups? Tanzi: Yes. Endorsements often come with donations. I support publicly financed elections. Not all of us are able to self-fund our campaigns, and I think having only the wealthy be able to run is a dangerous road to go down. Question: Would you support banning high-capacity magazines? Question: Do you support the holding of a constitutional convention? Question: Would you support legislation that would legalize marijuana? Tanzi: I think we will eventually get there, but I would not support it until we have the guarantee from the federal government that they will not prosecute; which may mean waiting for a new President and Attorney General. Watch and learn form CO and WA in the meantime and see how they figure out the banking issues.